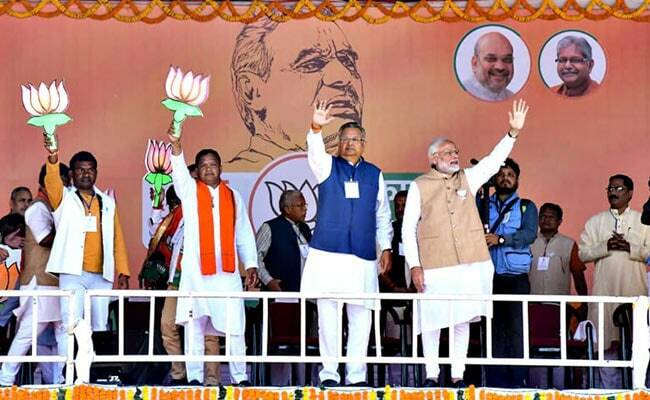 The Chhattisgarh assembly elections are being seen as a prestige battle for three-term Chief Minister Raman Singh and as Congress' fight for resurgence. Raman Singh fought from Rajnandgaon seat against Congress's Karuna Shukla. Chhattisgarh Chief Minister Raman Singh was leading by 1,200 votes over Congress nominee and former prime minister late Atal Bihari Vajpayee's niece Karuna Shukla in Rajnandgaon Assembly seat, as per the latest poll trends. However, five ministers from the Raman Singh-led BJP government in Chhattisgarh were trailing in the state assembly elections as per latest trends, a poll official said on Tuesday. Brijmohan Agrawal (Raipur City South), Kedar Kashyap (Narayanpur constituency), Mahesh Gagda (Bijapur), Dayaldas Baghel (Nawagarh) and Amar Agrawal (Bilaspur) - are trailing, as per trends in the state Assembly polls. However, state presidents of the BJP and the Congress- Dharamlal Kaushik and Bhupesh Baghel -were leading from Bilha and Patan seats respectively. Leader of Opposition TS Singhdeo and Congress lawmaker from Durg Lok Sabha seat Tamradhwaj Sau were leading in Ambikapur and Durg Rural seats, respectively. This time, the coalition between Mayawati-led Bahujan Samaj Party (BSP), former chief minister Ajit Jogi's Janata Congress Chhattisgarh (J) and Communist Party of India (CPI) has added another dimension to the electoral politics of thestate which has been dominated by the BJP and the Congress.